Supplied: Bureau of Meteorology / ABC article. A cyclone warning has been issued for people in parts of Western Australia’s Kimberley and Pilbara, with gale force winds predicted. The Bureau of Meteorology (BoM) has forecast the first cyclone of the season after El Nino caused hotter and drier than average conditions. The BOM has issuing a tropical cyclone advisory declaring a watch zone from Cape Leveque to Mardie, including Broome, Wallal, Port Hedland, Dampier and Karratha. BOM‘s Neil Bennett said the bureau was watching a tropical low 660km north-west of Broome for signs of a developing cyclone. 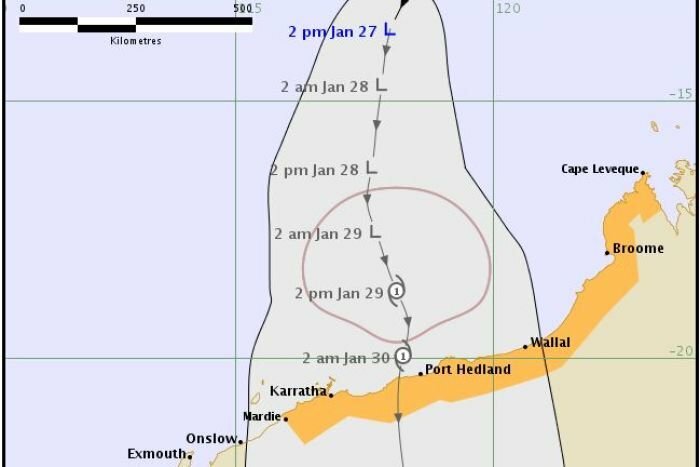 “Certainly one possibility is the development into a full-blown tropical cyclone,” Mr Bennett told Vanessa Mills on ABC Kimberley Local Radio. Mr Bennett emphasised it was too early to be sure if a cyclone would develop. “It may just bring periods of strong winds and heavy rain, so that’s the range of scenarios that we’re looking at,” he said. With the developing system expected to move south towards the east Pilbara and west Kimberley coast over the next 48 hours, if a cyclone does form, it is not anticipated to be able to develop to a severe intensity. “Current thinking is if that happens, it’s got such a small period of time for it to form, that we don’t anticipate that that would end up being a category three or above,” Mr Bennett said. The BoM‘s advisory warns that even if a cyclone does not develop, strong to gale force winds are likely near the centre and to the north of the system. With few exceptions, north-west Australia has experienced a hot and dry start to the wet season, which Mr Bennett said had been caused by the El Nino event in the Pacific Ocean. “The suppression of tropical activity due to the influence of the El Nino conditions in the eastern Pacific, that’s the main influence,” he said. “The first week of January saw some really hot stuff. But Mr Bennett said the Madden-Julian oscillation was overcoming El Nino’s hot and dry influence. “It’s essentially a wave of enhanced convection that moves around the globe, running from west to east,” he said. Mr Bennett said that despite the late start to the cyclone season, Pilbara and Kimberley residents needed to remain vigilant. “[Last year] was a non-El Nino year and we didn’t see our first land-falling cyclone until March, so we’re still in the cyclone season,” he said.